Over the past decade, education has upped its game. We’ve seen new standards implemented, new technology introduced and new funding to support STEM initiatives. With these advances in education have come new expectations for what our students should be able to learn and produce, and, unfortunately, not every classroom is equipped with the tools to meet those expectations. Enter the library makerspace: a place to design, code, create, test and extend learning. 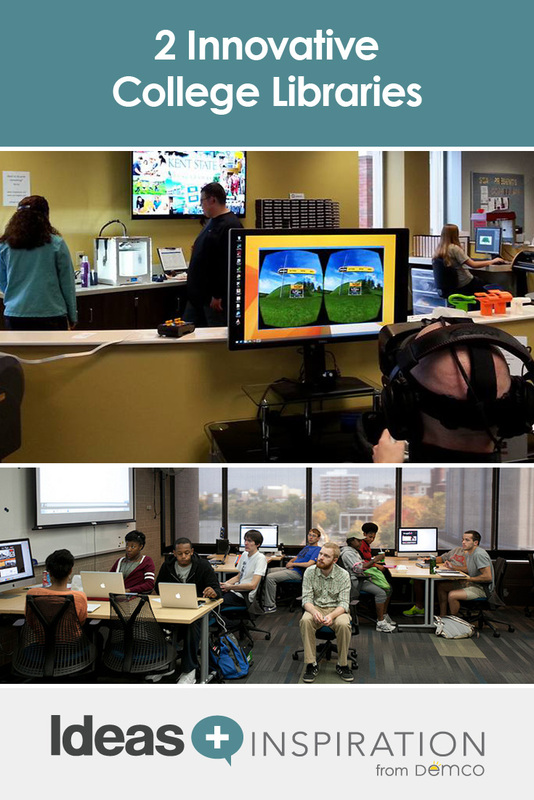 As centers of learning, college libraries are reinventing their spaces to facilitate just about anything students can dream up. It’s an easy concept for libraries to embrace, as it gives a name to some of the services they already offer and allows them to broaden the tools and technology they have available to meet the evolving needs of students. With a growing foothold in primary and secondary schools, makerspaces have also found their way into college libraries — or maybe they were always there. 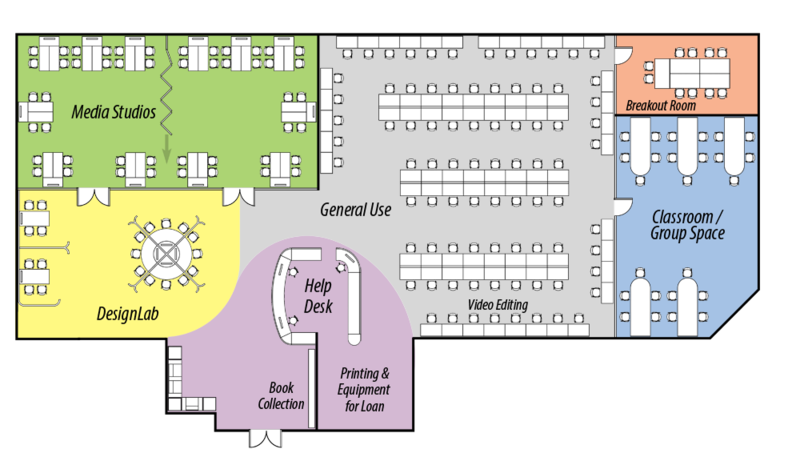 As John Burke points out in “Making Sense: Can Makerspaces Work in Academic Libraries?” many of the resources found in these collaborative spaces already existed as labs in separate departments. The changes lie in taking an interdisciplinary approach: integrating the tools and resources that inspire innovation and facilitate making into a community learning space—the library (Burke, 2015). 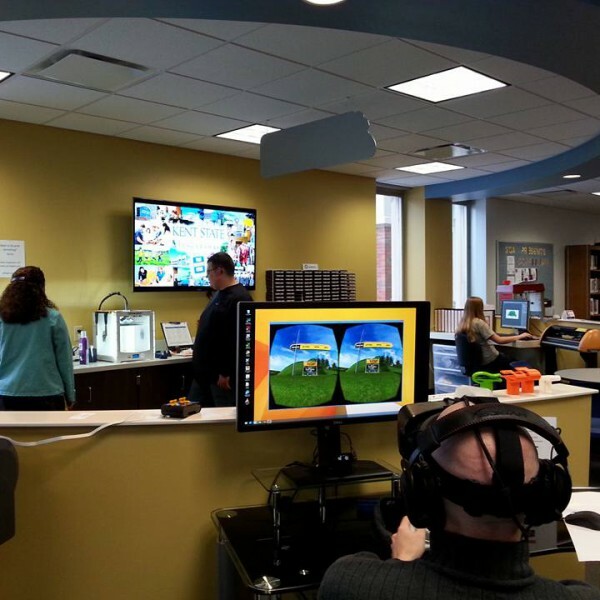 In response to the expanding role of academic libraries, Kent State established the Makerspace at Kent State University at Tuscarawas, transforming its space to cultivate budding entrepreneurs and push student projects into the real world. 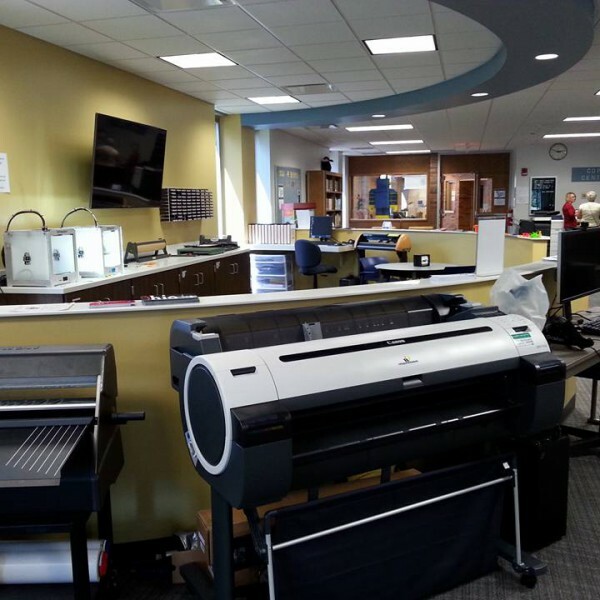 The Makerspace features tools to innovate and create, including a vinyl laser cutter, a large-format printer and a 3D printer, an erector set, green-screen setup, and robotics kits. 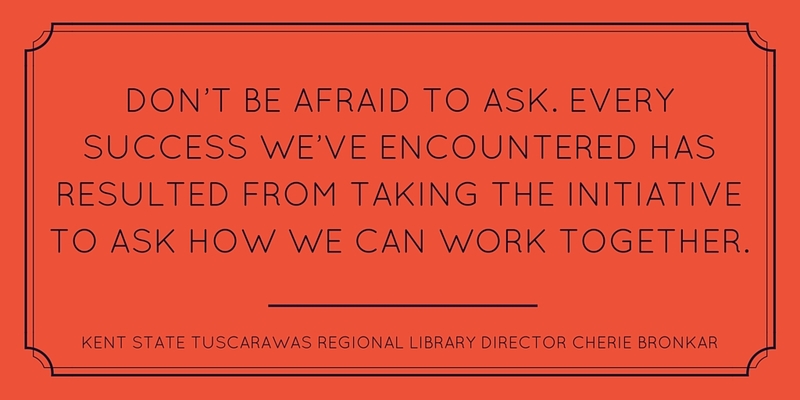 Below, Kent State Tuscarawas Regional Library Director Cherie Bronkar shares how the university created a space that features a wealth of resources that benefit library users and the surrounding community. Students utilize the Makerspace at Kent State University Tuscarawas to solve real-world problems. Can you share the thought behind creating a makerspace for use by the students and the community? The library has always been open to the community, so allowing the same access to the Makerspace was intrinsic. Our vision for the Makerspace is to encourage an entrepreneurial spirit in our students and our community. One of the community-friendly aspects of our Makerspace is that it goes beyond providing a space to explore and offers support to those wanting to develop an idea into a business. The campus has always worked closely with the community and the Makerspace gives us yet another chance to give back. Students and community members can create in the Makerspace and work with liaisons from the Ohio Small Business Development Center, Business and Community Services and Blackstone Launchpad, to develop their creations into marketable initiatives. The campus works together with the community to grow these initiatives and provide a vehicle to do so through our Tolloty Technology Incubator, located adjacent to the campus. Any tips for developing partnerships with other community agencies? Don’t be afraid to ask. Every success we’ve encountered has resulted from taking the initiative to ask how we can work together. Many community agencies are looking for partners, and they may not know what you have to offer if you don’t ask for their involvement. The other side of this is to be open to their needs; what you go in offering might not be what they need. By opening a dialog you discover together how best to serve the community. Can you share some highlights from the first year of your makerspace? This first year has been a whirlwind of activity and putting out feelers for how we can best serve the university and the community. Much of our focus has been on introducing the space to area schools, libraries and our own students and faculty. From these introductions we’ve learned a lot about how our users interact with the space. While many come in to see the equipment, it’s really when they have a specific project in mind that the lookers become users. Last summer we welcomed local 4H groups to visit the Makerspace. These groups focused on a Civil War project and located designs for 3-D objects pertaining to the Civil War. We assisted in printing out their designs to add to their 4H projects. We will be having them back next summer to build on the skills they learned. Some of our biggest successes have come from those seeking a solution to a problem. One such problem was brought to us by our biology faculty. Their lab assignments included examining and photographing microscope slides. For this they needed a way to attach different types of cell phones to microscopes. Students worked together in the Makerspace to develop a microscope clip. These students went through several design phases and created an entirely new design, which could ultimately be patented. The clip was developed by students from our nursing and criminal justice programs. While we’d expected engineering students to be our main users, it turns out that our users are often students whose focus is not on technology or engineering, but who have an interest in problem solving in general. Recently another need was brought to our attention through an animal rescue center. As a result of this request, our students have developed the skills to design and create a prosthetic device. We see huge potential here and hope to incorporate it into projects that we can align with our Veterinary Technology program. Based off the success of our needs-based projects, we are reaching out to the community to discover new ways users of the Makerspace can solve problems. Here in Tuscarawas County we’ve created a community of makers. Along with providing an area to explore and invent, the intention of many collaborative library spaces is to support the increasingly media-heavy projects students are asked to produce in lieu of traditional essays or research papers. 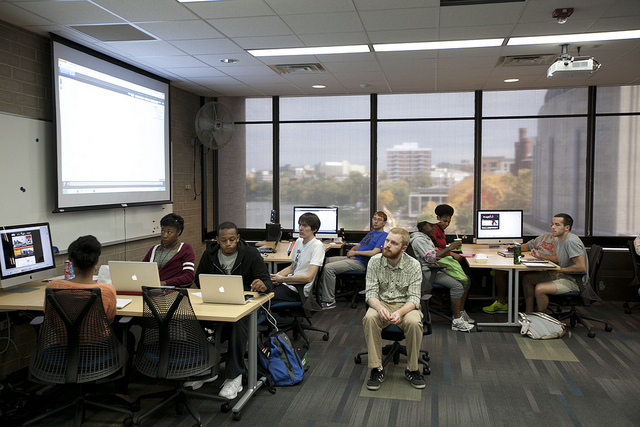 One such example is the DesignLab at the University of Wisconsin-Madison College Library. and aesthetics. Photo by Brent Nicastro, copyright 2012. Permission to use by UW-Madison Libraries. The tools students need to write and present their learnings no longer consist of just paper and computer. To help them make this transition to more interactive, visual forms of reporting, consultants are on-hand at the DesignLab to help shape projects from concept to completion. These experts introduce students to new tools and guide them in best practices for their use. A look through the student gallery reveals a range of ways students have used the lab to translate their learnings into multimedia projects. Not only does the DesignLab support students in developing twenty-first-century technology skills, it also offers support to instructors to help them integrate smart media projects into their curriculum and assists them in evaluating student efforts with assignment suggestions and rubrics. Classrooms space is also necessary to support instructors who want to integrate digital media into their courses, says Carrie Kruse, Director of College Library at UW-Madison. The Media Studios, located in the library’s computer lab serve his purpose and include movable, untethered tables, multiple ways of engaging with technology, multimedia sound capabilities, and, being located in the library, are accessible to everybody, not just certain departments or students. Whenever the classrooms are not being used for scheduled classes, the spaces are open for general student use, allowing collaborative space for work on digital projects. The Media Studios are adjacent to DesignLab, and with access to the computer lab’s help desk and equipment check-out, the library provides a full suite of services that support student digital media assignments. UW-Madison’s Media Studios are available for semester-long courses with a media component, one-time workshops or broadcasts, and open for use during unscheduled times. Photo by Brent Nicastro, copyright 2012. Permission to use by UW-Madison Libraries. UW-Madison’s Library offers multi-purpose spaces to fit the evolving needs of students. Image copyright 2015 by UW-System Board of Regents. Used with permission. 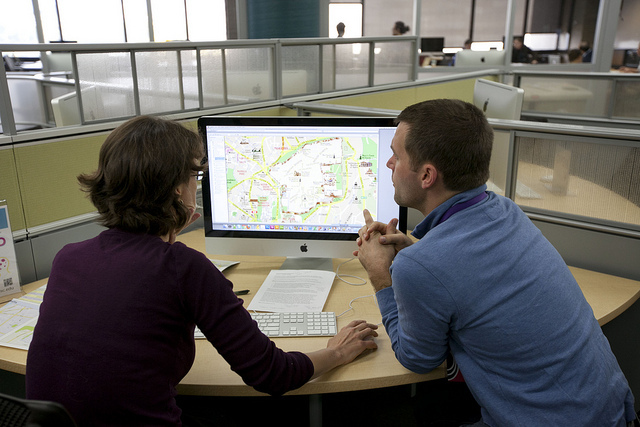 To see more of UW-Madison College Library’s collaborative spaces, visit the DesignLab and Media Studios on flickr. More than ever, library spaces are evolving to meet students’ needs: shared spaces that offer training, access to maker tools, and flexibility for collaboration. These two university libraries have faced these challenges head on and have created interdisciplinary centers of learning that foster a spirit of collaboration and innovation and helping transform students’ ideas into reality. To learn more about creating collaborative library spaces, read Come Together! Collaborative Spaces in the Library and visit the DEMCO Interiors blog to read about how Creative Spaces Support Lifelong Learning from library consultants Kim Bolan Cullin and Marisa Amara. Burke, John. “Making Sense: Can Makerspaces Work in Academic Libraries?” Association of College & Research Libraries, 2015.